Geologist Hendrik Albertus Brouwer (1886-1973), on the left in the picture, was the head of the geology department at University of Amsterdam, where his research focused on structural geology and mineralogy. 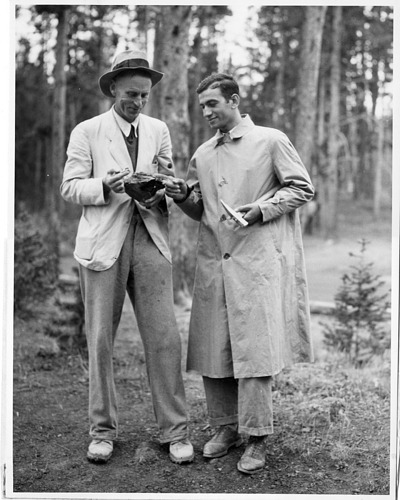 This photograph was taken while he was conducting research in Yellowstone National Park in the United States, most likely in 1935. In 1936, Brouwer published two articles on the geology of Yellowstone National Park. In one of these ("On the Structure of the Rhyolites in Yellowstone Park," The Journal of Geology, November-December 1936), he stated that during July and August of 1935 he had joined up with researchers who had been conducting research in the Yellowstone-Beartooth-Bighorn region for several years. He mentioned Princeton University professor W. Taylor Thom and Yellowstone's chief naturalist Clyde Max Bauer, and also acknowledged assistance from three students - H. Jansen of the University of Amsterdam, W. H. Pecora of Princeton University, and A. Howard of Columbia University. The other person shown in the photograph was not identified in any accompanying materials. Can you help the Smithsonian Institution Archives identify the young man on the right? Was he perhaps one of the geology students?